Chad and the team will be making the long trip down the line with talented gallopers Spitfire Lady (pictured) and The Last Shower as they contest the Listed Wairarapa Breeders Stakes over 1600m at Tauherenikau tomorrow. 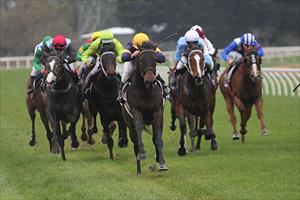 Multiple black-type performer Spitfire Lady was very unlucky not to get the breaks in the Group 1 Telegraph at Trentham last month, while her third placing in the Listed Newmarket Handicap was very encouraging. “She’s worked extremely well this week and she’s a good traveller, so we are expecting a strong performance,” co-trainer Chad Ormsby said. Spitfire Lady will be dropping in class for tomorrow’s event and looks a good winning chance. The second of the two runners will be The Last Shower who the stable has plenty of time for. Jockey Johnathon Parkes will be taking the mount and the small freshen up looks ideal for her heading into tomorrow’s race. “She’s very well and we can’t fault her,” Ormsby said. “On her day she can be very hard to beat. We are hopeful that we have her spot on for tomorrow’s race as she is a mare that is deserved of black-type.